In the latest issue of Training and Simulation Journal, Michael Peck has an article about board gaming. Unfortunately, this article is only available in the print version of the journal so I can't link you to it. Mr. Peck makes a point about how boardgames are still relevant and great tools to understand historical conflicts. He focuses in tactical wargames, including the almighty Advanced Squad Leader. 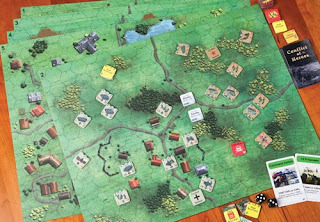 A bit more detail is provided on relatively recent boardgames, like "Conflict of Heroes: Awakening the Bear" (Academy Games). "Conflict of Heroes: Awakening the Bear". Image from Academy Games used without authorization or monetary gain. Comment below if you want it removed. I was kind of surprised to see an article about paper wargames surrounded by ads for computer simulation projectors that cost around $100K a piece. I never played a paper wargame so I'm not in a position to judge. But anyway, one must remember that right after the news that Saddam invaded Kuwait broke, a high level Pentagon official called Booz Allen Hamilton's wargames honcho Mark Herman demanding a quick reaction wargame on the crisis. Mr. Herman was already wargaming the crisis with his peers. The game of choice was "Gulf Strike", a boardgame Mr. Herman had published a time before. 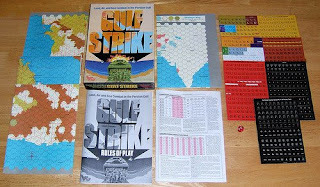 "Gulf Strike", the boardgame by Mark Herman. Image from boardgamegeek.com used without authorization or monetary gain. Comment below if you want it removed.